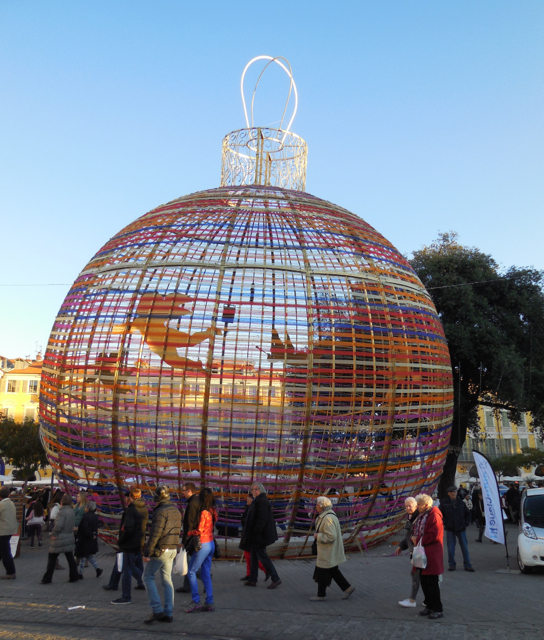 Giant ornament sculpture in Grimaldi Square The Nice Christmas Markets were in full force last weekend as I made my way through the carnival atmosphere in Grimaldi Square to the shopping area. Along the way to the markets I encountered such magnificent sights as the new pavilion which is a vast open green space with playgrounds for the children, gardens for the horticulturists and benches for the aged and the young in love. Today, the Fairmont Monte Carlo unveils a new restaurant by legendary Chef Nobu which was formerly a pop-up concept but is now a permanent part of the hotel. It will occupy the space previously taken by their formal dining room. The hotel added a narrow terrace space providing a bit of outdoor seating where diners will experience the serene views and sounds of the Mediterranean Sea. In addition, Nobu restaurant added a spectacular bar and two private meeting lounges. 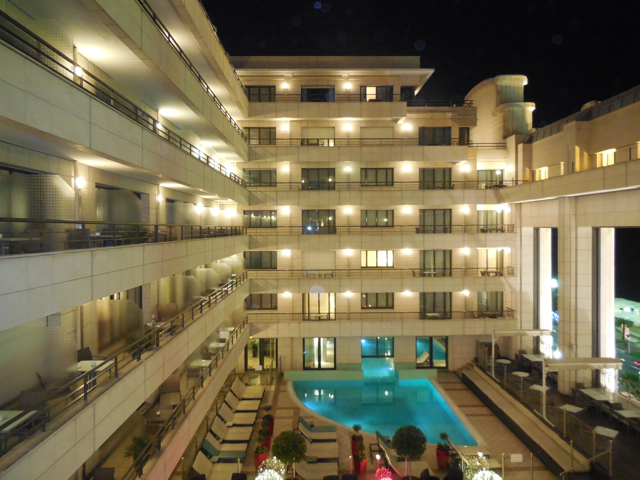 I am leaving France and spending my last night in the beautiful Nice Hyatt Hotel Palais de la Méditerranée. It is almost midnight in Nice and I am packing to head back to the US in the morning. The International Luxury Travel Market has kept me very busy with press briefings and breaking news from the world of luxury travel, however, I did take some time during the lunch break Tuesday to visit a few nearby landmarks and take in the local beauty while sightseeing in Cannes. Centuries old food recipes, charming pedestrian streets, spectacular views of the yachts in the harbor and iconic Cannes Film Festival murals were among the highlights of the walking tour from professional guide Karin Osmuk who works at the Palais des Festivals et des Congrès - Cannes Visitor's Bureau. 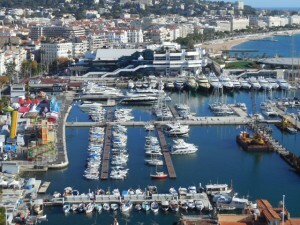 The city of Cannes owes its notoriety around the world to the ingenious idea to host a unique film festival once a year which brings the best of the best from around the world in the film industry to this tiny little town in southern France. Artists pay homage to the festival with several large murals throughout the city. 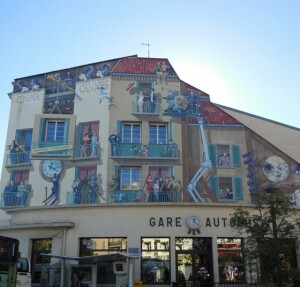 At the foot of Old Town, the entire front of the Gare des Autobus (bus station) is one such mural dedicated to the history of the festival itself. Actors, both real and animated, are depicted on the facade of the station from the early days of black and white film to more recent animated cartoons and feature films. After 24+ hours of non-stop travel to Cannes, it seemed like a good idea to head out into the fresh air for a vigorous walk to get the lay of the land, verses taking a nap before my 6:00pm International Luxury Travel Market kickoff evening. The Tourism Office in Cannes provided a lovely tour guide, Karin for me today to enjoy the 20 minute boat ride out to Île Saint Honorat where the working Abbey remains today. 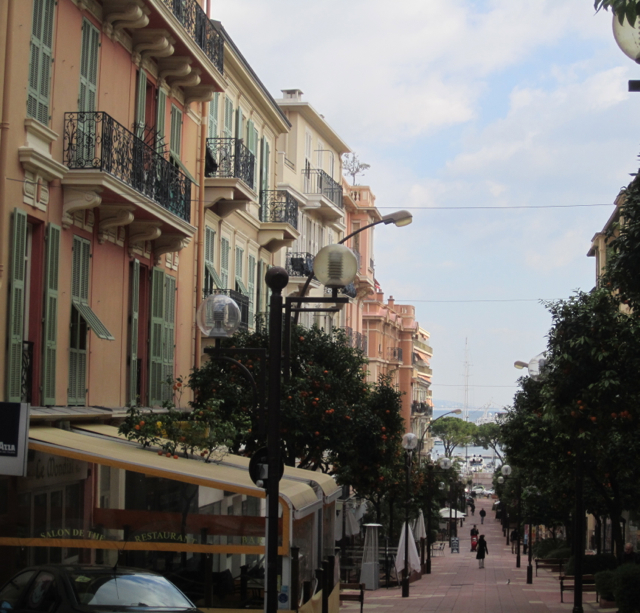 Downtown Monte Carlo While attending the International Luxury Travel Market in Cannes, as part of the invited press, I will be doing some sightseeing, experiencing some one-of-a-kind activities and reviewing some of southern France’s best restaurants. 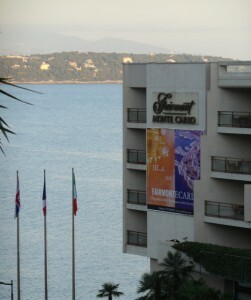 Come along on my visit to Cannes, Nice and Monte Carlo. Take off is from Houston, connecting in Dulles to Zurich with the final destination Cannes. After dropping my bags off at the four-star Hotel Mondial, I will make a beeline for the Tourism Office, Palais des Festivals et des Congrès de Cannes, to meet my guide for a quick overview tour of the city. After attending an official briefing about all things luxury at the Market, I will have the privilege of dining at La Palme d’Or, (2Michelin) at Hotel Martinez. In addition to this fantastic culinary delight, another night I will dine at Le Park 45, (1 Michelin) located in the Grand Hotel on La Croisette. 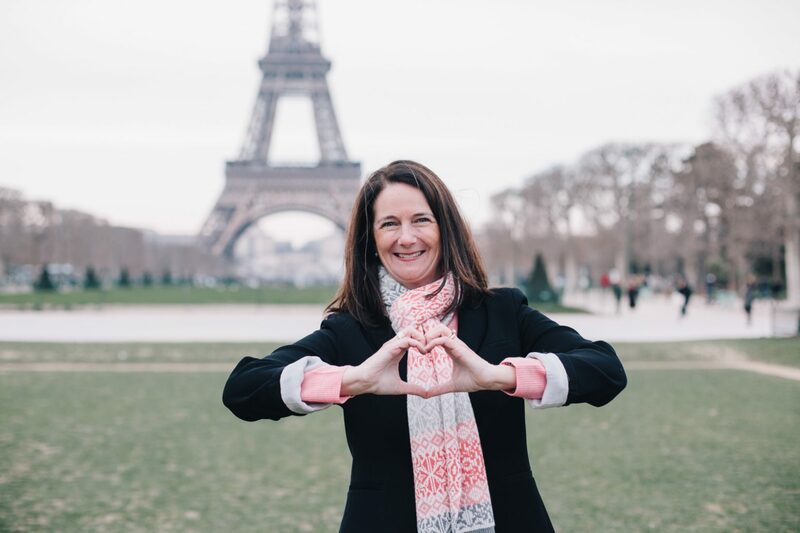 Margo is in Paris spending three weeks with her husband, Rob, in an apartment. She is enjoying the festivals and the gastronomy in Paris. Grocery shopping in Paris is one of the best parts of renting an apartment and Margo and Rob are certainly making the most of the culinary offerings close by. 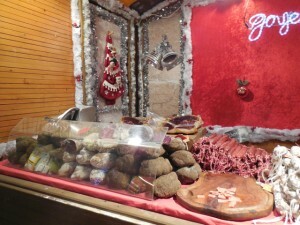 Below are some foodie musings from Paris via Margo. Readers who travel to Paris and miss their peanut butter need fret no more. It’s available at La Grande Epicerie at Bon Marche and some supermarkets. Brands vary. We found jars of creamy and crunchy from Arkansas and the UK. Alas, all have sugar added—a taboo for those concerned about such things. 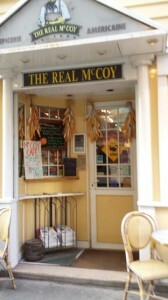 And almost any American product you might want can be found on 194 Rue de Grenelle at The Real McCoy which carries, they say, the largest selection of products from the US in Europe. No need to use up your airline weight allowance bringing these items from home, although you will pay more for them here. 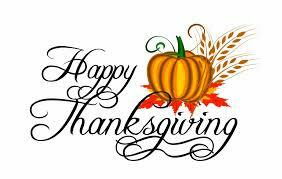 With everything left to do before we sit down to eat our feast today, I am taking a minute to pause and give thanks this Thanksgiving for the blessings that come from all of you! Fact: Without the support of my family, none of this would be possible. Thank you Mr. Weekend In Paris for the 20 plus years of research that went into the making of The Weekend In Paris. He supported my yearly, now turned multiple times a year, habit of meeting the original Gal Pal Lisa in Paris and now me bringing others along too. He believed in me when I might not have believed in myself. He held down the fort with the kids when they were young despite his own grueling schedule and is simply the best man I have ever known. When people ask who the heroes in life are, I point to him. Honest, hard-working, loyal and loves me and the kids first and foremost. Not perfect, mind you, he is still looking for that open spot in the hamper in the bathroom to deposit his socks and underwear, but I'll keep him! Multigenerational travel to Paris is easier than most people think, as long as you follow a few simple tips. The usual trip to Paris for me, for over 20 years, has been with girl friends (my Gal Pals) and/or with Mr. 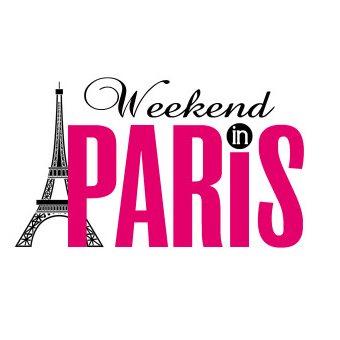 Weekend In Paris. This past summer it was about time that fellow Francophile's - my mother-in-law and two sister-in-laws accompanied me as the latest Gal Pals. The rule was that each person had to pick one thing that was on their "bucket list" to accomplish. First priority, of course, went to my mother-in-law, Maryann, as the Matriarch of the group for our multigenerational travel to Paris.